André and Madeleine have been in love for over fifty years. This weekend, as their daughters visit, something feels unusual. A bunch of flowers arrives, but who sent them? A woman from the past turns up, but who is she? And why does André feel like he isn’t there at all? 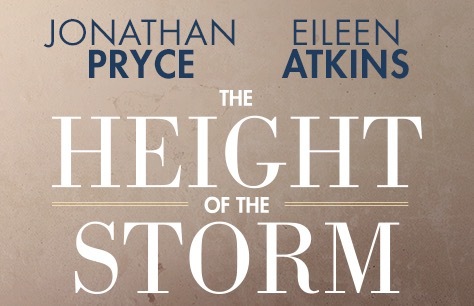 The Height of the Storm is a beautifully compelling family drama by Florian Zeller, “the most exciting playwright of our time” (The Guardian). Starring two of the greatest actors of their generation on stage together for the first time, this major new play from the writer of Olivier Award-Winning The Father is a searing exploration of love, family and the fragility of life. Jonathan Pryce is an internationally acclaimed, award-winning actor of stage and screen. His varied work includes lauded performances in film including Brazil, Glengarry Glen Ross, Carrington and Evita and on stage in a landmark international tour of The Merchant of Venice, Comedians for which he received a Tony Award and Miss Saigon in the West End and on Broadway. He most recently appeared as the High Sparrow in the hugely successful Game of Thrones. Dame Eileen Atkins is a three-time Olivier award-winning actress. She is known for her BAFTA and Emmy award-winning performance in Cranford, as well as roles in film including Gosford Park, The Hours and Robin Hood. Her many stage appearances include Honour, Retreat from Moscow and Ellen Terry. She can be seen most recently as Queen Mary in Netflix’s The Crown.